Writing this from Whitby again, after a couple of pints so apologies for any spelling errors! Listening to reggae in the Buck Inn Bar, taking me back some 20 years to holidays in Nidris in Greece and the No Wind Club! Had a slightly later start than anticipated due to Mr Timothy Taylor keeping me up later than expected, but worth it from the spiritual side of things. Still packed and on the road by 9am with an 86 mile stretch ahead of me, with a tailwind of sorts so comparative luxury to yesterday. Rode North through Withernsea and various small villages, with the sea never from sight which was nice after Lincs. Stopped in Hornsea after 30 miles and did some shopping at supermarkets – two rounds of sandwiches for a quid cos they were about to go out of date, plus jelly babies, crisps and a drink. Visited Hornsea Mere and Seafront for a break, nice town and somewhere Lu went as a babe. Again got some photos I’ll put up in due course. There were ducks on the mere and I think I found the Hornsea pottery museum as requested. Random thought – must give freeganism a go as planned, need to do a supermarket skip raid to load up the panniers. It’s not strictly illegal you just have to be careful, and I hate seeing food go to waste. From Hornsea I piled on the miles through Flamborough and on to Scarborough, encountering the first real hills since North Norfolk, real Yorkshire Hills too. Power Monkey working well and recharging in the sunshine – topped up phone, but still think a dynamo hub would be better. Scarborough very nice and would be worth visiting for a few days I reckon. Had a scoot around ignoring the Nemesis device’s constant ‘you have gone the wrong way’ beepings. Lots of good spots for photos which I’ll insert in due course. It’s also true what Mike Carter said in his book, you notice scents more as you’re passing through places, lots of interesting smells from the nasty to the nice – including perfume wafting from pretty girls in summer dresses. That’s a nice smell incidentally. Rode up to the castle in Scarborough, big hill. Weather lovely and sunny again but the temperature suddenly dropped on the way out of Scarborough, must have been a weather front coming through. Strange to have such a sudden drop in temperature, I couldn’t be bothered to stop and put on layers so I just cycled faster. Now an advantage to cycling, of which there are many but this one is particularly satisfying. Sailed past several traffic jams today caused by bank holiday cars and caravans. Gave my bell a jolly ring as I rode past sweating drivers, screaming children, and annoyed people in general. Started humming ‘Road to Amarillo’ accidentally, must be because I was up North, but it was then stuck in my head of next few hours. Tried to replace it with songs from Buffy the Musical and was soon belting out ‘Walk through the Fire’, no doubt to the bemusement of any pedestrians. Turned on to the Cinder Trail North of Scarborough which is apparently a good bike trail, and route 1 was signposted that way. Started off well…got steadily more eroded…I started creaking, bike started creaking, arse starting creaking, then I passed the Hayburn Wyke Inn. Quickly doubled back for a pint – fantastic pub frequented by lots of cyclists taking the Cinder Trail. Was just leaving when a rock band turned up, wish I could have stayed. Lots of motorbike parties and many tattoos in evidence. Lobster rebelled, so I stayed for another pint. A long ascent followed up towards Robin Hood’s Bay, again along a very bumpy track eroded by the bad winter. The trail is really filthy as it’s built on cinders, hence the name, so everything including me was getting coated in black dust. Ascent finally finished at Ravenscar, which I think is a cool name. A railway line was supposed to finish here but apparently it was never actually finished, the trains couldn’t make it up the gradient. Grea ride through the Yorkshire National Park, past cows going home for the night and beautiful scenery. Photos to follow. Finally had a long descent to Robin Hood’s Bay, very bumpy and somewhat treacherous at speed but I was buoyed by the thought of reaching the campsite at the bottom. Passed lots of other cyclist who said hello, including one I couldn’t strictly understand however I nodded and made appropriate noises in the right places which seemed acceptable. He mentioned Reynolds Tubing so obviously knew something about cycling but think he might have spent the afternoon in the pub. Robin Hood’s Bay is lovely, and built up the North side of the bay, unfortunately my campsite turned out to the be at the top of that North side. A truly lung bursting ascent followed, with a severe gradient. Had to push for a bit but didn’t feel too guilty as later learned an Italian competition rider was using it for training. Finally arrived at the campsite about 18.30, and set up quickly as needed to get the pasta on – Lloyd Grossman sauce tonight, with biscuits and bananas. On the Banana front I’ve worked out I can attach them to my back rack on the cargo net, so must look funny cycling along with a bunch of bananas. Will try and attach more fruit as I go. Settled down for the night and started to write my journal, only to be interrupted by fireworks from the cliffs to the South of the bay. Really nice end to the day. Hopefully will update again tomorrow with Whitby happenings, all good. Listening to cool guitar in a the pub and slightly missing having my own guitar, but wouldn’t fit without a trailer, now there’s a thought, but really wouldn’t have survived the Cinder Trail. 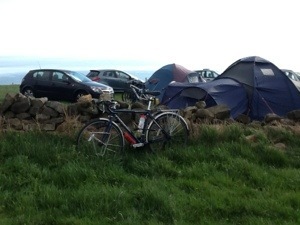 This entry was posted in Bike around Britain 2013 and tagged adventure, bicycle, bike, cycle touring, cycling, expedition, fundraising, robin hood's bay, Scarborough, tailwind on May 6, 2013 by SelfPropelled.